Spar Deflection | Tennessee Aircraft Services, Inc. There are many things you don’t want to find at the first or second annual after purchasing your plane. Every Cessna model has its own set of specific known issues that a maintenance specialist in the model will see at a glance. 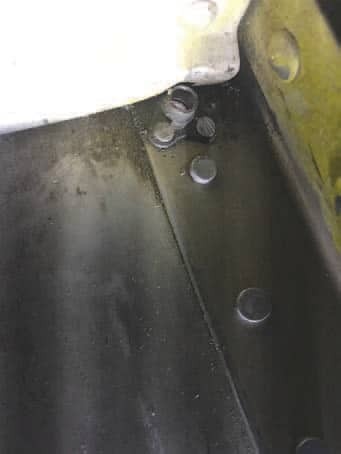 Ignoring the wrong spot of corrosion or an “insignificant” dent during a purchase can be the catastrophe that condemns a plane to the salvage yard. The list of possible insignificant little dents that can euthanize an otherwise flyable Cessna is pretty long, but it only takes one. Most big ticket death sentence items are what one might call “naturally occurring” (definitely not standard terminology). Naturally occurring damage would include structural corrosion or stress cracks in primary structures. Less costly natural issues are worn tires, cylinders with low compression, high oil consumption, annual inspections, airworthiness directive compliance or any other routine maintenance items. An unnatural item is damage caused by some sudden event not part of normal operating procedures. A gear up landing, pushing the plane into the back wall of the T hangar, runway excursion into a snow bank or slipping off the lift jacks are a few examples of unnatural damage events. Today a new to us 210 arrives with small dents in the bottom of both wings at the lift point mount area. The right side is the worse with the deepest deflection at the aft edge of the leading edge skin being about 0.150”. The left side isn’t as bad at only 0.050” but has evidence of filler application and painting to cover it up. Such shallow dents might not be a problem on some places on the plane. These two are exactly at the wings’ main spar cap aft flange and pose a definite structural risk. We know these dents are caused by maintenance when the jack pads are incorrectly installed. On this early cantilever winged 210, the jack pads have only two screw mount holes, and the lift point is slightly off center. The intent of the off center is to position the lift point directly under the center of the spar web. If mounted incorrectly, the lift point is nearly in line with the rivet row, which puts a huge bending load on the spar cap flange. 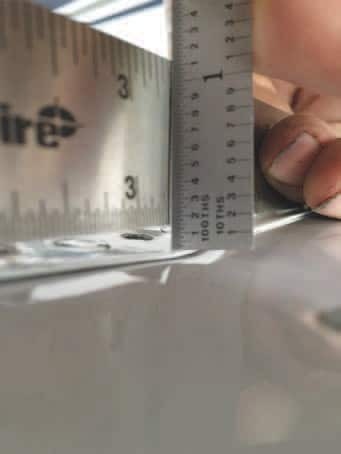 Very coarse measurement of the depth of the deflection shows about 0.150″. The hole in the lower skin is one of the jack pad screw holes. In the newer versions of the 210, the jack pads are mounted with three screws that are not in a straight line. This Murphy proofing works most of the time. There are always going to be a stray mechanic who is convinced the lift point should be at the rivet line. Leaving out the one offset mounting screw bypasses the safety measure designed specifically to prevent this spar flange bending problem. One of the jack pad screw hole nut plates as seen from inside the wing looking down. Of important note is how the rib is bent even to the point of touching the screw when installed. There’s no information in the service manual or any other Cessna printed documentation that fully addresses this exact situation. There is information in the “Structures” section of the service manual with generic guidance for categorizing wing spar damage which we can use. Negligible damage is defined in “Structures” as smooth dents, light scratches, and abrasions. If the damage found fits this description, then no action is called for. Before we commit to this, we’ll check the next category of damage for more guidance. Repairable damage is presented as a different sort of list. The manual basically says that “cracks, stress wrinkles, deep scratches and sharp dents” must be repaired. It then directs the reader to some sample repair definitions. There’s also a limit on repairs to the spar inboard of wing station 155 (near the inboard seam of the the aileron) without factory approval. Given the two choices above, it would appear we can call the found damage a “smooth dent” and just let it continue to fly as is. Under the Repairable description, we safely determine this single deflection of the spar cap aft flange isn’t a stress wrinkle, deep scratch or a sharp dent. However, the possibility of it having a crack is real and must be investigated to confirm this damage doesn’t slip from Negligible to Repairable. Spar cap flange bends at the jack pad have a history of causing cracks in and below the bend radius of the flange. A crack in the lower spar cap inboard of station 155 is an almost certain catastrophe. There’s also a wing rib that gets bent in the worst cases where it attaches to the spar cap at this same spot. Looking forward with a straight edge in place makes for a pretty dramatic view. A good visual inspection might be sufficient if all the affected area can easily be seen. Unfortunately, access inside the wing in this area is precluded by the outboard flap bellcrank and its related support structure. A good quality borescope can get in to see most of the interior but not all. There’s also the problem of inspecting the underside of the spar cap that is covered by the overlap of two wing skins. Our inspection solution includes two elements. The first is to remove the flap aft rollers so it will hang vertical and slightly away from the wing. We then drill off the wing trailing edge close out skin directly aft of the damaged area. This opens the entire interior of the wing aft of the main spar and the outboard side of the spar cap at the hoist point. This solves the access problem for visual inspection of the top of the flange but not the underside. We could drill enough rivets from the lower wing skins to drop them down for a look, but that’s an unnecessarily invasive process. An eddy current inspection allows an electronic look into the aluminum mass of the spar cap. 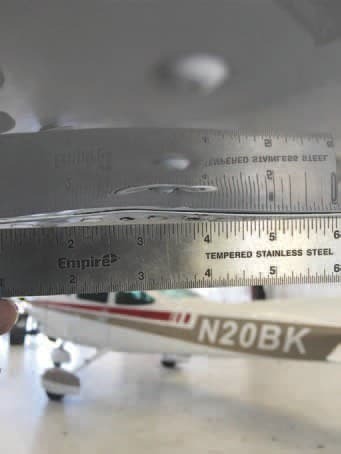 This is Cessna’s preferred method to inspect the very inboard lower spar cap for cracks as described in a Supplemental Inspection Document SID 57-11-05 and related to FAA Airworthiness Directive AD 2012-10-04. We are able to get the eddy current probe into the space for a good test. Using the proven eddy current process as a second element of the inspection, we are able to support the visual inspection finding of no cracks noted. With the wing open, it’s very easy to apply a few mallet strikes to the top of the flange and straighten it out. This makes everything look right and eliminates any future discussion about the damage. Structural Aluminum is very hard and really doesn’t like to be bent twice. Once the flange is deflected upward, the material is compressed together at the inside radius. Straightening the bend pulls that compressed material apart and may cause the very cracks that we want to avoid. We’ll just leave well enough alone and continue to monitor the area at future scheduled inspections. Anytime damage is found that poses a threat to the flying future of a plane, an owner’s first thought is to consider just how dangerous it was to have been flying around with this structural damage. This time the danger is negligible, but performing a proper investigation is the only way to know and be able to continue flying with confidence. An owner’s second thought is how much it will cost to repair. If it exceeds some owner-defined threshold, the airplane might be sold off to the proverbial glue factory. If it doesn’t exceed the owner’s financial pain threshold, the next thought would be to determine the source of the funds to pay for the repairs. This is when circumstances might finally take a turn for the better. Naturally occurring damage and the associated repair costs are always the burden of the owner. However, unnatural damage could very likely be covered by one’s insurance provider. The burden on the owner shifts to providing evidence that the cost to repair this damage is within the scope of the insurance policy. Proving this is usually pretty obvious when the damage occurs under the watch of the current owner. It’s often not so obvious when evidence of the unnatural damage is found many years after the plane is purchased by the current owner. The possible financial salvation provided by the insurance company requires deep reading of the policy and some sleuthing into the origin of the damage. One company may be willing to pay for repair of any damage discovered regardless of when it occurred. Others may only pay if it can be shown the damage wasn’t pre-existing to the current owner’s control. Either way, it doesn’t cost much to ask and potentially could save a nice plane from its ultimate demise. Not every dent or wave in a plane’s skins is indicative of some hidden failure. Every rivet set in aluminum causes some stretching and deformation of the sheet. Multiply that by the thousands of rivets and these planes have certain deflections straight from the assembly line. It’s not realistic to expect perfection from aluminum airplanes, particularly the older the legacy Cessnas. Knowing what’s normal and what’s dangerous is the key. Discovering the potential problem early may be the difference between many years of safe flight and the scrap yard.